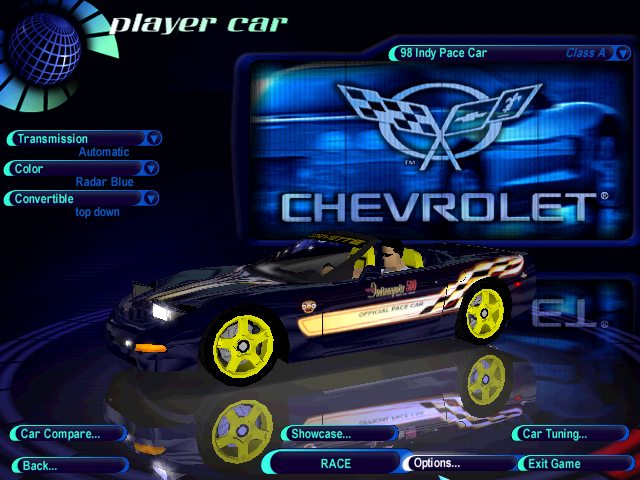 Description A replica of the 1998 Chevrolet Corvette C5 Convertible Indy Pace Car made by CVPI19. This mod was inspired by it's appearance in NFS III on PC if you bought a copy orignially from Walmart back in the fall of 1998. It also includes it's own showcase slides, but has the audio, & other data from EA's Corvette showcase, as well as EA's Corvette dash modified, and vidwalls. Credits go to XJ220 for the original base, Xentek for the rims from his 97 C5 Coupe, AJ_Lethal for making the scheme, & helping me map the base onto it, and EA for the original dash, & other data. Grovergames_YT it must be your internet connection because there's nothing wrong with the file at all I downloaded it myself and its fine. I will be uploading a Coupe replacement based on XJ220's C5 coupe with upgrades and a convertible version complete with upgrades too. Wow i'm impressed!! Is exactly what I was waiting from a long time ago, but unfortunately always when i try download it, i get the "Unexpected end of the file" message error. Pls reupload the mod. Thats a great replacement! The details are awesome. Complete with damage, dashview, speech files and showcase.